Mafia 'boss of bosses' Salvatore 'Toto' Riina has died in hospital while serving multiple life sentences as the mastermind of a bloody strategy to assassinate Italian prosecutors trying to bring down the Cosa Nostra. Riina died at the age of 87, hours after the Justice Ministry had allowed his family members bedside visits on Thursday, which was his birthday, after he had been placed in a medically induced coma in a prison wing at a hospital in Parma, northern Italy. The Justice Ministry confirmed his death. Riina, one of Sicily's most notorious Mafia bosses who ruthlessly directed the mob's criminal empire during 23 years in hiding, was serving 26 life sentences for murder convictions as a powerful Cosa Nostra boss. He was captured in Palermo, Sicily's capital, in 1993 and imprisoned under a law that requires strict security for top mobsters, including being detained in isolated sections of prisons with limited time outside their cells. The bloody campaign ultimately backfired and led to his capture as the enraged state fought back after bombs killed Italy's two leading anti-Mafia magistrates, Giovanni Falcone and Paolo Borsellino, two months apart in 1992. Top anti-Mafia prosecutor Franco Roberti said Riina had never repented for his crimes. "He was still considered the 'boss of bosses', even in prison," he said. 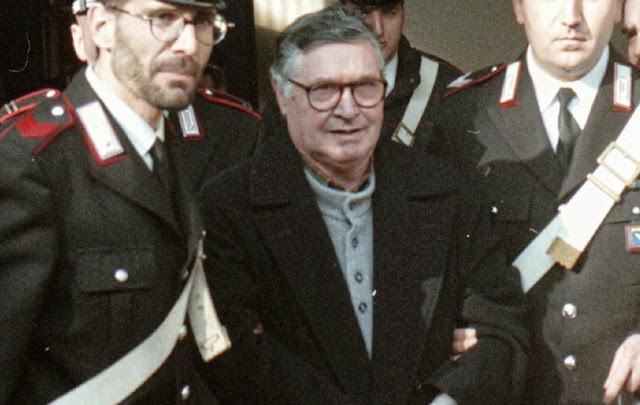 Mr Roberti said his death will lead to a power struggle at the top of the Cosa Nostra, even if his decades in a Milan prison cell, with severe restrictions on his contacts, ensured he no longer had any operational influence. The prosecutor said the Cosa Nostra had been marginalised in recent times in comparison with the Calabrian-based 'ndrangheta organised crime syndicate that has spread into Italy and northern Europe. "But as always happens, these periods alternate and there are changes. We are now seeing an increase in activities on a financial level by Cosa Nostra subjects. We are monitoring this," he said. Riina was born the son of a farmer in the mountain town of Corleone in central Sicily. The town's name was borrowed for the main character in the Godfather novels by Mario Puzo, written years before Riina rose in the Mafia ranks and later made into blockbuster films. Investigators believe Riina jockeyed his way to the top of the Mafia by pitting rivals against each other, and then standing out of the way of the bloodshed that felled one boss after the other in the 1970s. He went into hiding in 1969 after being ordered by the state to leave Sicily after he had finished a five-year prison sentence for Mafia association. During his decades on the run, the only picture authorities had of the fugitive was more than 30 years old. More than one Mafia defector said Riina had come and gone as he pleased during the years as Italy's top fugitive, directing Mafia activities from Palermo. He was handed his first life sentence in 1987 after being tried in absentia on murder and drug trafficking charges. For decades, he seemed to mock law enforcement as he reigned from underground over the mob's drug trafficking network and ordered the deaths of top anti-Mafia fighters. Anti-Mafia investigators worked with turncoats to zero in on the "capo dei capi", locating Riina and blocking his car on a Palermo road on January 15 1993, within months of Mr Borsellino's murder. Riina refused to collaborate with law enforcement after his capture. The archbishop of Monreale, which includes Corleone, said Riina's death "ends the delusion of the Cosa Nostra boss of bosses' omnipotence". "But the Mafia has not been defeated, and therefore we should not let down our guards," Archbishop Michele Pennisi said. 0 Response to "Mafia assassination mastermind Salvatore TotoRiina has dies in hospital while serving multiple life sentences "